Ask the Belly Dance Costume Goddess: What Is a Baladi Dress? What Is a Baladi Dress? 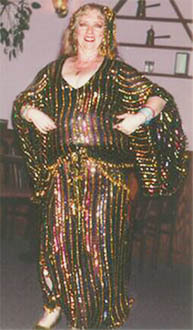 Okay, you have mentioned hiding the tummy... What is a baladi dress? I am a very excited beginner, but I have very very bad stretch marks. I want to show skin but "it is bad". I can't find any pictures or patterns to help. Any suggestions? I appreciate anything you can do to help! 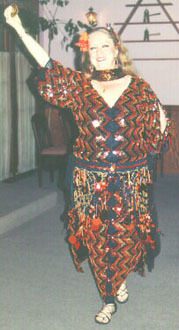 This picture shows a typical baladi dress. It's a long sheath style for folkloric dance that's worn with a hip scarf or fringed belt, and usually has sleeves. It can be glamorous in sparkly stretch lace, sheer knit, or velvet, or more folky in an ethnic pattern or assuit (hammered metal strips in the fabric). If you are an accomplished seamstress, a basic fitted sheath can be used as a pattern — cut the neckline as low as you like, in front and back, but keep a small strap across back neck to avoid shoulder slippage while dancing. Zipper could be at back or on the side. The "Arabic" cut-out sleeve and semicircular sleeve ruffle are modifications. Click on the photo to the right to see the dress in more detail. If you have a slim figure but need to cover stretch marks or scars, the dress could be form-fitting. If you need to camouflage a protruding tummy, the dress could have a roomier fit. The dress in the diagram to the right shows a more theatrical variation, with form-fitting style, and neckline cut low enough to show the bra. The dancer Morocco from New York City is one of the leading experts in the U.S. on Egyptian dance. In this photo, she is wearing a beautiful baladi dress designed and made for her by the legendary Egyptian costume designer, the late Madame Abla. 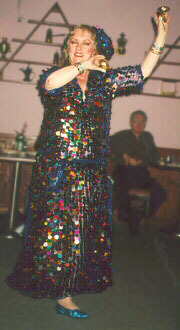 As this photo shows, a baladi dress can be very sparkly. Click on the photo to see this dress in more detail. In the photos below, I am wearing two different baladi dresses. (The blue unitard worn under the dress on the right is not a traditional way to wear such a dress.) Click on either photo to see more detail. PHOTO CREDIT: The photo of the striped dress on the left was taken by Pixie Vision Productions, Glendale, California. The one on the right of the black assuit dress worn over the blue unitard was taken by John Rickman Photography, San Jose, California. In Egypt, the word baladi literally means "my country", the "home" someone's family came from before they migrated away from the villages and into the cities. Today, the term has taken on the broader meaning of the culture of traditional values and traditional lifestyle. Whether still living in rural areas or now living in an urban center such as Cairo, the word baladi carries a connotation of wholesomeness, tradition, and simple lifestyle. It is similar to how the word "country" is often used in the United States to refer to a "heartland" or "salt of the earth" culture. The word can also be used in a disparaging sense, to refer to someone who is unsophisticated. 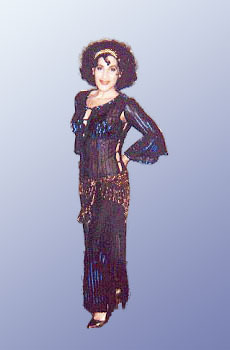 The term baladi dress can be used interchangeably with the word gallabiya, when referring to the women's version of the long, loose-fitting garment in the traditional style. An Egyptian person would normally just use the term gallabiya. The image to the right is on the envelope for the "Egyptian Shirt" pattern sold by the Folkwear pattern company. A dancer who wished to make a traditional style of gallabiya could use this pattern, choose opaque cotton fabric, and make the dress long enough to reach the floor. A traditional gallabiya or baladi dress has a high neckline, wrist-length sleeves, and no slits in the skirt. 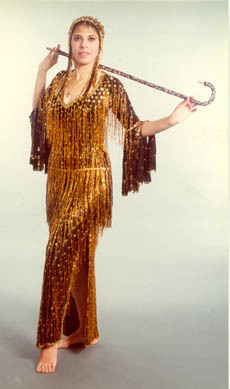 In contrast, a dress used for purposes of a dance costume may be modified from this basic style for theatrical purposes. It may have a lower neckline, be made of a sheer fabric worn over a slip, have sleeves that come only to the elbow, feature some embroidery, use sparkly beads and sequins in its decoration, and have slits on the sides. For more detailed information about baladi dresses and other costume dresses, see Dresses in Middle Eastern Dance Costuming elsewhere on this web site. Ask The Costume Goddess: Large Tummy. This was the Costume Goddess article that triggered the question on this page. Ask The Costume Goddess: Baladi Dress With Veil. Choosing a baladi dress that looks good with veil work. Dear Shira: What About My Scars? Shira responds to a reader who asked what to do about scars when making costume decisions.